In the name of Jesus Christ, grace and peace to you from our loving God. Since 2011, church leaders from many families of U.S. Christianity have worked together to maintain a Circle of Protection around people struggling with hunger, poverty, and injustice. You have participated alongside us in this ministry. We are now writing to share the Circle of Protection steering committee’s current thinking about the poverty-related issues facing us between now and this fall’s elections. We don’t all agree on every statement in this letter, but we think you will find it helpful to read about the issues we are discussing. The budget and appropriations packages that Congress approved in February and March marked a major step forward in the Circle of Protection’s seven-year campaign to protect funding for domestic and international programs that help people in poverty. Despite seven years of budget brinksmanship and the deep cuts proposed in President Trump’s budgets, Congress has not approved any substantial cuts in anti-poverty programs. The clear and unified position that you and many other Christian leaders have maintained–and the activism of many Christians across the country–have contributed to this remarkable result. We are concerned about the recent surge of deficit spending, especially since only three percent of it funded assistance to people in poverty. Most of it went to the top one percent of the income distribution. When Congress and the president decide to address the deficit, as they should, no one should suggest doing so by cutting programs that help people in poverty. Right now, Congress is working on the Farm Bill. We are opposing the House Agriculture Committee’s version because it would take away SNAP food assistance for more than two million people. It would reduce food assistance by $18 billion, in large part to finance an expanded SNAP bureaucracy. It would expand job requirements. All beneficiaries would need to report their status (whether they are working, caring for small children, disabled, or elderly) monthly rather than twice a year–a six-fold increase in paperwork, frustration, and possibilities for error. The very limited funding this bill provides for job training would not allow for effective training. The House bill is defended as a strategy to get SNAP beneficiaries into jobs. But nearly three-quarters of working-age adults who are not on disability work within the month or year of receiving benefits. Almost two-thirds of SNAP participants are children, disabled, or elderly. The House voted down their Agriculture Committee’s bill, but Republican leaders have announced their intention to bring it back for another vote this month. The Senate Agriculture Committee just approved a bipartisan Farm Bill that does not include damaging cuts and changes to SNAP. Please do what you can to defeat the House version of the Farm Bill and encourage passage of the Senate bill. Action on this issue is urgent. President Trump has directed all the departments of government to do an immediate review of all means-tested programs. The president wants them to find ways to cut costs, mainly by imposing new or expanded job requirements in core safety net programs: Medicaid, SNAP, and housing assistance. Evaluations of work requirements in assistance programs have found them to be an ineffective way to get people into jobs and reduce poverty. A much-cited exception followed welfare reform in 1996 when TANF work requirements were put in place. But the initial gains in employment were not sustained. Continuing job requirements on cash assistance to needy families have instead contributed to a surge in deep poverty–people living on less than $2 a day of cash income. The goal of program reforms should be to get people out of poverty, not just get them off the programs. We are hoping that our nation’s political leaders will pivot from their current focus on job requirements to policies that would improve job opportunities, especially for low-income people. When they consider investments in infrastructure, for example, we would like them to give priority to investments in communities of concentrated poverty. Public transportation from low-income neighborhoods to centers of employment would make it possible for many more families to work their way out of hunger and poverty. Broadband internet access would help depressed rural communities connect to economic activity. Can you educate people who look to you for leadership about the disadvantages of expanded job requirements on assistance programs and about the possibility of policies that would improve job opportunities? Congress is now working on Fiscal Year 2019 appropriations, including important decisions about many specific programs. President Trump has proposed $15.4 billion in rescissions from past appropriations, including a $7 billion cut from the Child Health Insurance Program (CHIP). In January, the Circle of Protection helped to develop and disseminate the Unity Statement on Racism and Poverty. Many church leaders are alarmed by the persistence and resurgence of explicit racism and hateful attitudes and policies toward immigrants. Racism is an attack on the image of God in each person, and racist laws and social structures are a major cause of poverty. Racial profiling and mass incarceration are realities that churches must no longer accept. The Unity Statement led us to restructure the Circle of Protection steering committee to include stronger African-American and Latino leadership. We are grateful that the October annual meeting of Christian Churches Together will include discussion of the Unity Statement and of how predominantly white churches can educate their members about structural racism. Criminal justice reform would be one way to address structural racism. The House of Representatives has passed a prison reform bill, but it does not address the problem of excessive mandatory sentences or effective models of restorative justice. Most of the faith community is supporting the Senate Judiciary Committee’s bipartisan Sentencing Reform and Corrections Act of 2017 (S. 1917). It would allow for judicial review of some mandatory sentences and strengthen federal-prison programs that reduce recidivism. President Trump’s harsh rhetoric and policies toward immigrants and refugees have done great harm. The faith community has expressed particular alarm about the separation of children from their parents at the border. We remain concerned about a regulation the White House is currently working on that would keep immigrants from becoming citizens if they have ever accepted public assistance. But the president and some members of Congress from both parties have said they want to reach a deal that would provide security for the “Dreamers.” The Dream Act (S. 1615 and H.R. 2440) would provide a path to citizenship for all the Dreamers, allowing almost two million young people to move up into better jobs and, in the process, help many people in their families and communities out of poverty. We hope you will join in faith-grounded anti-racism education and help to achieve criminal justice reform and positive immigration reform. There is opportunity for positive action on international hunger and poverty issues. The Global Food Security Act is up for reauthorization. That could continue our country’s effective agriculture and nutrition assistance programs for another five years, with concentration on fragile states where conflict and climate change are increasing hunger. It would also continue hard-won improvements that have made U.S. food assistance more efficient and effective. This is important in desperate situations such as in South Sudan and Yemen. Concerned Christian people can help by urging their members of Congress to cosponsor the Global Food Security Act. It is bill number S. 2269 in the Senate and H.R. 5129 in the House. Broad, bipartisan approval of the Global Food Security Act is possible and would help to protect appropriations for aid to hungry and poor people around the world. Finally, church leaders are called to be both thoughtful and bold in helping their members contribute to the healing of our wounded body politic. Some Christian leaders are speaking out about the theological dimension of the exceptional turmoil and division we are suffering. Some Christian organizations are helping people of faith have an impact during this fall’s elections. We know you are praying for our nation and the world. Urge people who look to you for leadership to ask God to guide their conversation and behavior as citizens. Urge them to exercise their civic duty and support candidates for office who will serve the common good and improve opportunity for poor and vulnerable people. In Jesus Christ, we experience the love of God for all people and are moved to help and defend people who struggle with hunger, poverty, and injustice. Unity Declaration on Racism and Poverty: A diverse body of Christian leaders calls on the churches and Congress to focus on the integral connection. As the president and Congress are preparing their plans for this year, almost 100 church leaders—from all the families of U.S. Christianity—are sharing a common “Unity Statement” on racism and poverty. As Christians, we are grounded in God’s love for all people, and we feel called to ask our churches and political leaders of both parties to work together to overcome racism and poverty which are theological, biblical, and gospel issues for us, not merely political or partisan ones. This moment in time and the clear movement of the Spirit have brought diverse multi-racial church leaders together over the last several months for dinner conversations and times of prayer. Out of those moving times together, we developed a Unity Statement on Racism and Poverty. It has attracted many more racially and theologically diverse church leaders and is now embraced by the Circle of Protection, the broadest group of Christian leaders focused on poverty. The leaders who have signed this statement are from African-American, Hispanic, Asian-American, Native American, Evangelical, Catholic, Pentecostal, and mainline Protestant churches; and many national faith-based organizations. We are all committed to help build a fresh, newly energetic, multi-racial Christian movement to make the integral connection between racism and poverty and seek the spiritual power to end both. We are also committed and are ready to work with allies from other faith communities on the crucial intersection between racism and poverty as it shapes public policy. We are purposefully sending you this statement before you go to your respective retreats. In addition to reading this statement thoughtfully, we ask for the following three things: first, we ask you to discuss this statement and the issues central to it—racism and poverty—at your retreats; second, we ask you to incorporate these concerns into your policy decisions and legislation in 2018 and beyond; third, we ask you to convene meetings with faith leaders in your communities to plan follow-up action on these issues in your states and districts. Racism and poverty are systemic issues that are central to the Bible and the teachings of Jesus. Therefore, they are critical to policy choices made by political leaders of faith and conscience. We will be following up with you directly to see how we can be helpful and useful to you as you consider these deeply biblical and theological issues. We believe if we Christians from diverse backgrounds and traditions were known, not mostly for our divisions, but for our unity in a shared commitment to faithfully address both racism and poverty—together—it could be powerful force—both for our churches and the country. So help us God. As Christian leaders, our concern is always about how legislation impacts the poor and most vulnerable. We will continue to pray, mobilize, and advocate on behalf of our neighbors in poverty. As Christian leaders, the concern is always about how legislation impacts the poor and most vulnerable. We will continue to pray, mobilize, and advocate on behalf of our neighbors in poverty. 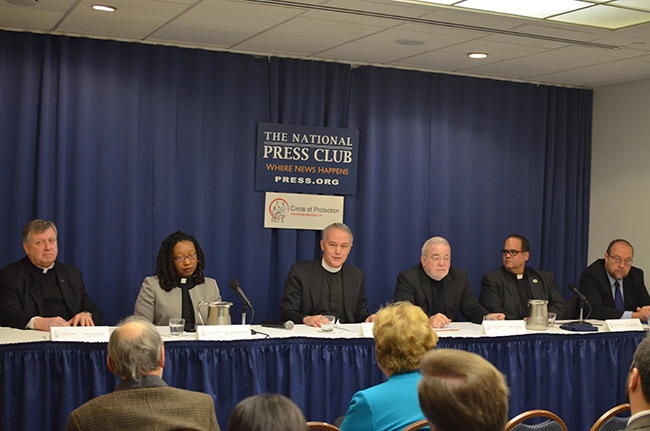 Washington, D.C., November 2, 2017 – A diverse group of national Christian leaders from across the theological and political spectrum today sent a letter to members of Congress urging them to maintain a “circle of protection” around programs of assistance for people in poverty. The leaders are concerned, because this fall Congress will make decisions that have far reaching consequences for people living in poverty and working families struggling to make ends meet. Specifically, the Christian leaders are calling on Congress to 1) protect funding for anti-poverty programs in appropriations bills, and 2) protect and support low-income families in any tax legislation. The Christian leaders belong to the Circle of Protection (CoP), a broad coalition of leaders from all the families of U.S. Christianity. The CoP is working to ensure the vitality of church-sponsored programs serving people in or near poverty in the United States and around the world, while also supporting public sector efforts to alleviate poverty and increase opportunity for all of God’s children. “We are bold enough to imagine news stories about Members of Congress from both parties joining together to support the urgent needs of low-income Americans and life-saving assistance to hungry and poor people around the world—because of the religious faith of those political leaders,” the letter adds. In the letter, the Christian leaders committed to praying for members of Congress as they develop legislation for the nation, especially as the legislation impacts America’s most vulnerable citizens and neighbors. Read the full letter with the complete list of signatories. Presidential candidates answer: How will you help the hungry and poor? agencies, organizations, and educational institutions. Contact us.